Myth and illusion have always been central to the working of imperial power; how often we hear the lofty rhetoric of freedom, democracy, and human rights to justify aggression and murder. Didn’t Britain’s Defence Secretary Des Browne recently call the war in Afghanistan ‘the noble cause of the 21st century’? We may balk at the audacity of our leaders as they righteously declare that they are liberating a nation whilst carrying out invasion and destruction on a massive scale. But depressingly, as Mark Curtis shows in Web of Deceit and Unpeople, this is certainly nothing new. In the course of these two books, Curtis offers a detailed and devastating history of British foreign policy since the Second World War, exposing Britain’s role and complicity in some of the worst atrocities and conflicts of the post-war period. Indeed he has plenty to say about the vicious myth of New Labour’s ‘ethical’ foreign policy and the huge gulf which exists between the self-serving illusions of the British political elite and the reality on the ground for those who are on the receiving end of our military force. But the disturbing reality which Curtis exposes is that the murderous policies of our present government are not exceptions or aberrations, but follow a consistent pattern of British foreign policy since 1945 which has been based on a shocking and horrendous disregard for human life. Two main themes run through both of these books; the first is that Britain’s foreign policy, both in its present guise in the ‘war on terror’ and historically since the Second World War, has had nothing to do with the promotion of democracy or the protection of human rights. In fact, quite the opposite. Curtis shows how British policy-makers have on many occasions shown an active contempt for democracy in pursuit of what is an ever recurring common goal among the elite: the creation and protection of economic systems which benefit Western corporations and investment. The second is the complicity of the ‘liberal intelligentsia’ (namely the media and academia) in these crimes through their systematic failure to report them accurately and in their servitude to those in power rather than to ordinary people. The first half of Web of Deceit, the first of the two books, concerns itself largely with contemporary matters; namely the destructive and illegal policies of the New Labour government in Iraq, Afghanistan, and Kosovo, as well as exploring the diplomatic, political, and often military support we provide to fellow human rights abusers in Russia, Israel, and of course the US. Although many of these subjects have been covered by others such as John Pilger and Noam Chomsky, it is refreshing to read an analysis which focuses specifically on the role of the British government in these atrocities, exposing with clarity and detailed precision the web of lies and illusions which has been spun to sell them to the British people. It is in his discussion of the war in Afghanistan that Curtis elaborates on his powerful but darkly ironic concept of ‘unpeople’; these are the ordinary people of the world, mostly in poor developing countries, who are considered worthless by the British political elite, whose lives mean nothing and who can be sacrificed in, it seems, limitless numbers if that is what it takes to impose economic conditions which are favourable to Western companies and elite interests. It is a form of racism which we see everyday in media reporting on these conflicts, where it seems the life of an Iraqi or Afghan civilian is simply not worth the same as that of a British soldier. 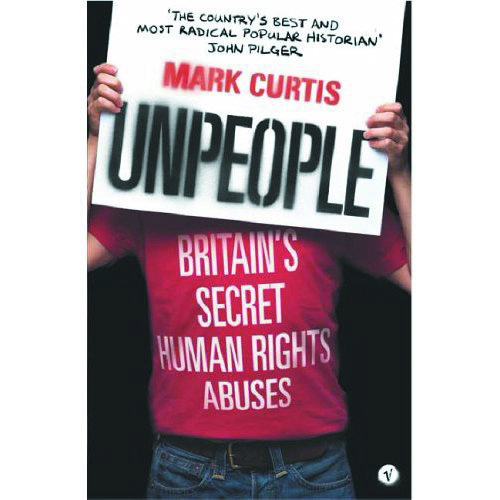 However, perhaps the most important contributions in this book involve Curtis’s work on declassified government files, exposing the secret history of Britain’s involvement in some truly horrific atrocities. Here he focuses on four specific cases; the 1953 MI6 and CIA organised coup in Iran which overthrew the popular nationalist government of Mohamed Mussadiq and installed the repressive regime of the Shah; the counter-insurgency campaign which was fought by the British in Malaya between 1948 and 1960 to protect British business interests and to ensure that they could continue to exploit Malayan economic resources; the overthrow of the democratically elected People’s Progressive Party in then British Guiana in 1953, who offended British business interests by demanding welfare reform, the redistribution of resources to meet the needs of workers, and the strengthening of trade unions; and finally, and certainly most horrendous, the British war against the Mau Mau movement of Kenya in the 1950s. After providing a brief history explaining the roots of the nationalist struggle and uprising in Kenya, Curtis goes on to describe in terrible detail the brutal repression carried out by colonial authorities, involving horrible abuses of police power, horrific torture and mutilations, and forced ‘resettlement’ of tens of thousands of Kenyans into Nazi-style detention camps and ‘protected villages’, in which thousands died of disease and starvation. Overall, Curtis estimates that 150,000 Kenyans died as a result of British policies in this period. Finally, Curtis extends his analysis to include the role of a largely compliant media, subservient to elite interests, in propagating the myths and illusions which are necessary to mask the reality of British foreign policy. He shows how the media plays a central role in an ideological system which is based on a blind commitment to the concept of the ‘basic benevolence’ of British policy. Through its uncritical acceptance of elite explanations, its failure to report certain policies, and its narrow framing and neglect of relevant history, the mainstream media consistently fails in its duty to hold our decision-makers to account. It is telling that the majority of examples he uses come from the Guardian, widely accepted as the most radical, left-wing mainstream newspaper in Britain. In Unpeople, Curtis focuses more closely on the war in Iraq. He provides a detailed exposition of the propaganda campaign which accompanied the build up to the war, shedding light on the essentially anti-democratic and authoritarian nature of British foreign policy decision-making, which consists of ‘a cabal of unelected advisers around its chief, the Prime Minister, taking decisions in an unaccountable and increasingly centralised way and contemptuous of restrictions on its authority from public opinion and international law.’ He also places the invasion into a wider context of the history of British complicity in violence in Iraq, and of the broader consequences for the future, namely the threats of increased terrorism and the lasting damage the invasion has done to international law. 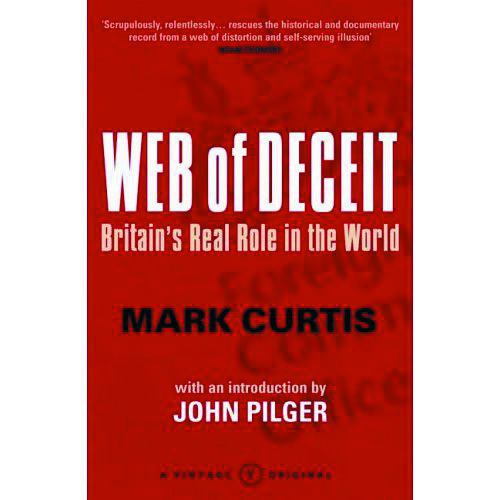 But again, as in Web of Deceit, it is his work on declassified government files to uncover some of the previously secret examples of British complicity in crimes of aggression and violence which offers the freshest insights into the working of British foreign-policy. Amongst the key findings presented here are secret, but substantial, support for US aggression in Vietnam; British complicity in the Nigerian government’s violence toward the region of Biafra during the civil war in the 1960s; and the ‘dirty war’ conducted by the British in North Yemen in the 1960s, which cost up to 200,000 lives. Throughout, Curtis stresses that at no point in the decision-making processes revealed by the declassified files did notions of human rights, democracy and freedom play any significant role. The overriding concern of policy-makers has been strategic and economic interests, and the preservation of a global economic-political order which is favourable to Western business interests. As a harrowing a conclusion to the book, Curtis has created a table which provides figures on the estimated number of deaths for which Britain bears significant responsibility since 1945. It consists of a list of all the conflicts in which Britain has been involved in the post-war period alongside the estimated number of deaths for each and the details of Britain’s role. Cases include both direct and indirect responsibility, as well as ‘active inaction’ (where Britain has helped to block international action to stop killings, as in Rwanda). Overall, Curtis estimates that Britain bears responsibility for around 10 million deaths. It is truly upsetting to realise how much blood has been spilt in our name in order to protect the right of Western corporations to exploit other people’s resources. So what is to be done? How can we stop this seemingly endless pattern of barbarism? Curtis sees the global justice movement as an effective counter-weight to the transnational elite which currently runs our world in such a brutal and repressive way, but argues that the different activist groups and social movements of which it is comprised need to come together under a more coherent, shared programme of promoting real democracy at both the national and international level. Only then can we reclaim the decision-making process from the blood-stained hands of the political elite who currently control it. In any case, after reading these books, it is impossible not to recognise the urgent need for action.